Dana Frasz deals in the currency of imperfect produce: crooked carrots, oranges with peels dotted with black spots, and potatoes shaped like snowmen. As the founder and executive director of the Oakland-based nonprofit Food Shift, Frasz spends her days finding ways to make sure that these ugly, but perfectly edible, fruits and vegetables (about six billion pounds of which never even make it off the farm each year because they’re deemed unfit for grocery stores) don’t wind up in the trash bin. Now, Food Shift is taking on its most ambitious project yet: a kitchen facility that the organization will run in collaboration with the Alameda Point Collaborative, a housing program for the formerly homeless that happened to have an underused commercial kitchen on its premises. The new project, known as the Alameda Kitchen, aims to be a win-win for both nonprofits. 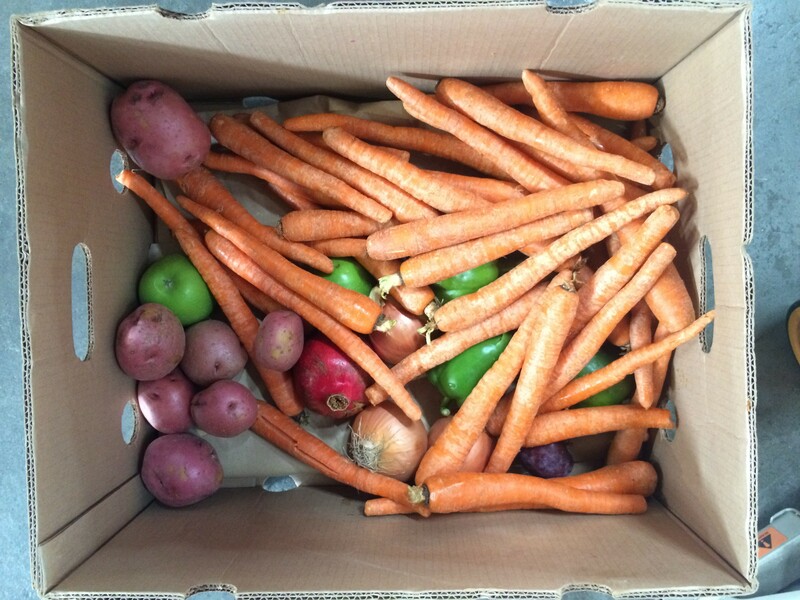 It will provide Food Shift with a fully equipped kitchen that the organization can use to process large quantities of produce and other surplus food, turning all of those ugly carrots and potatoes into nutritious products that can either be given away or sold to schools, hospitals, and other meal providers. And for Alameda Point Collaborative, the kitchen will be an engine of economic development, providing hands-on job training to residents of the housing program, who will acquire skills that might allow them to go on to land jobs at restaurants or other food-related businesses. Food Shift’s mission is an important one at a time when food insecurity and food waste are both increasingly urgent problems in the Bay Area — especially in light of the US Department of Agriculture and the US Environmental Protection Agency’s recent jointly announced goal of reducing food waste on a national level by 50 percent by 2030. Frasz explained that the project is loosely modeled after DC Central Kitchen, a Washington, DC-based nonprofit where she briefly volunteered in 2008 — an experience she credits with inspiring her to create Food Shift to begin with. Mostly, she was inspired by the ways in which DC Central Kitchen’s mission went beyond simply feeding people. The kitchen provides job training to individuals who come from marginalized backgrounds. And, by turning surplus food into products that can be sold by the catering company the organization runs, it has created a financially sustainable business model that employs graduates from the training program. Similarly, the Alameda Kitchen aims to be a self-sustaining, community-oriented program that will provide both food and jobs to people who need them. In that respect, the Alameda Point Collaborative seems like the perfect partner. Almost all of the heads of household among the housing complex’s five hundred formerly homeless residents have some kind of disability. And Briggs said that aside from the obvious benefit of acquiring job skills, he believes it will be empowering for the residents to do so in a way that really gives back to the community. Dana Frasz (right) tests a soup recipe at the Alameda Kitchen. Frasz said her hope is to change the current paradigm in which under-resourced food assistance organizations — soup kitchens, food banks, and such — often struggle to find ways to use up donated food before large quantities of it go to waste. Sometimes that’s due to a lack of infrastructure, which is why, for instance, Frasz hopes to buy a food dehydrator in order to help extend the life of over-ripe fruit. And Food Shift has also enlisted the help of alumni from Stanford University’s Graduate School of Business who will do some pro bono market research to help refine the Alameda Kitchen’s business model and figure out what food products would be optimal, given Food Shift’s steady stream of discarded carrots, potatoes, and such. Frasz is currently recruiting a chef to handle recipe development, but she already has a number of ideas for products that the Alameda Kitchen might sell. Most fall in the ultra-practical realm of soups and smoothies, but Frasz also dreams of one day stocking corner stores in East and West Oakland with $1 popsicles made from cosmetically challenged fruit — a healthier alternative to the bags of potato chips that schoolchildren might otherwise buy. And she said she has peeked into the dumpsters outside of large juice chains such as Jamba Juice often enough to know about the massive quantities of carrot pulp that they throw away each day — pulp that could form the base for a delicious veggie burger, Frasz said. Frasz, a vegetarian, said the main focus of the project would be on produce, but she didn’t rule out the possibility of including meat or dairy if the organization got a hold of a large quantity of surplus items that would otherwise spoil. Food Shift recently launched a $30,000 crowdfunding campaign to help pay for the purchase of kitchen equipment, and allow Frasz to hire a part-time chef and provide employment to an initial cohort of trainees. The tentative plan is for the Alameda Kitchen to open officially in April 2016.